The Scaffie is fast and full of adventure and is just as capable as the bigger boats. The Scaffie is built to the same proud standards of craftsmanship evident in all our craft. The single standing lug-sail is loose footed for safety and simplicity, it gives the Scaffie a really brisk performance. A 2-3 hp outboard is all you will need to drive this boat along. The Scaffie makes an excellent rowing boat, and is light to pull and easy to hold on course. An optional sloop rig is also available. Though only 4.5 m ( 14ft.9″ ) overall, the Scaffie is quite roomy, because there is no centre-plate to fill up the cockpit. For a full specification plan please see HERE: For pricing and options click HERE or click on the picture in the bottom of the left hand column. Watercraft Magazine wrote a very good article on the Scaffie. 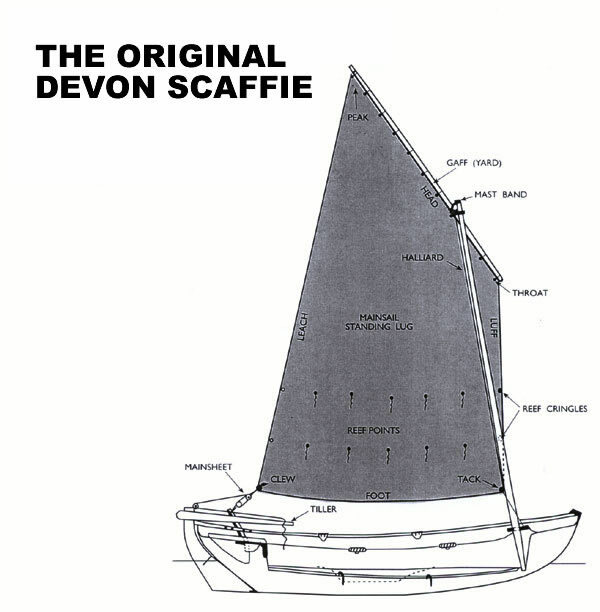 This boat was originally called the Drascombe Scaffie and then re named Original Devon Scaffie.